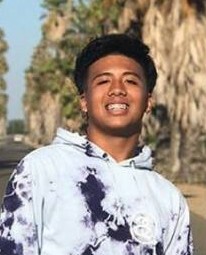 Jerald Jerome Asican, 17, entered into rest suddenly on Saturday July 21, 2018 in Lathrop. He was born January 12, 2001 to Joselito Asican and Leah Egos. Jerald leaves behind his parents and his two brothers, Jeremy and Joseph Asican. He leaves also his foster mom Betty Cousins and foster siblings,(Anthony, Nicole, Molly, Andrew, Andrew, Ally, Dayna, and Milana) In addition Jerald leaves the broken hearts of friends, faculty, coaches and an entire community that will forever miss him. Jerald was a Lathrop resident. He attended Lathrop High School where he excelled in football and wrestling. He was an over achiever and looked to do his best in every subject. Thoughtful, Compassionate, Spontaneous and Energetic where some of the words used to best describe Jerald. He was wise beyond his years, accepting and loving unconditionally. His mission to help others was evident as he left prints in every ones heart. The gift of his smile was unique to say the least; it would transcend which made everyone gravitate towards him. His pride and joy were his brothers, Jeremy ever so valiant and the protector to his youngest brother, Joseph his best friend and confidant. The bond between the three of them was concrete, he had them and they had him. Jerald had definitely come to this world to be that unforgettable soul that you only meet once in a life time. Jerald will be remembered for walking a perfect line as a true child of God. He will be deeply missed. P.L. Fry and Son is honored to serve Jerald’s family. Visitation will be held on Wednesday, August 1, 2018 from 1:00pm to 5:00pm at P.L. Fry and Son Funeral Home, 290 North Union Road, Manteca, Ca. A Prayer Service will be held on Thursday, August 2, 2018 at 11:00am at P.L. Fry and Son, Manteca, Ca. He will be laid to rest a Park View Cemetery, 3661 East French Camp Road, French Camp, CA. For condolences to the family please visit our website at www.plfryandson.com search obituaries.